Let me lay one thing on the table before I even begin this post – I am not a boat person or one who enjoys beaches or pools. I could probably still swim to save my life, but would prefer not to swim at all. Haven’t been in a bathing suit for years. But when our friends Lisa/Matt Mead suggested that we bicycle up to Manistee, MI to spend the night on a retired Great Lakes rail ferry, it seemed like a good idea. The SS City of Milwaukee was commissioned in 1931 to replace the SS Milwaukee which sank in Lake Michigan in 1929 with all hands aboard. 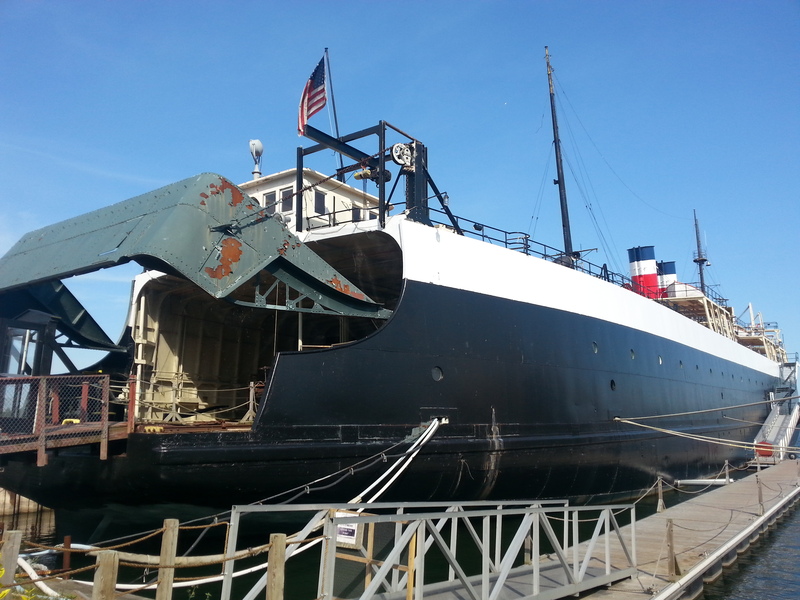 After its last run in 1982, it wound up in Manistee, where it’s slowly being restored. A pretty impressive sight at first glance. As opposed to a Great Lakes car ferry (of which there are still some sailing), the City of Milwaukee was a rail ferry. 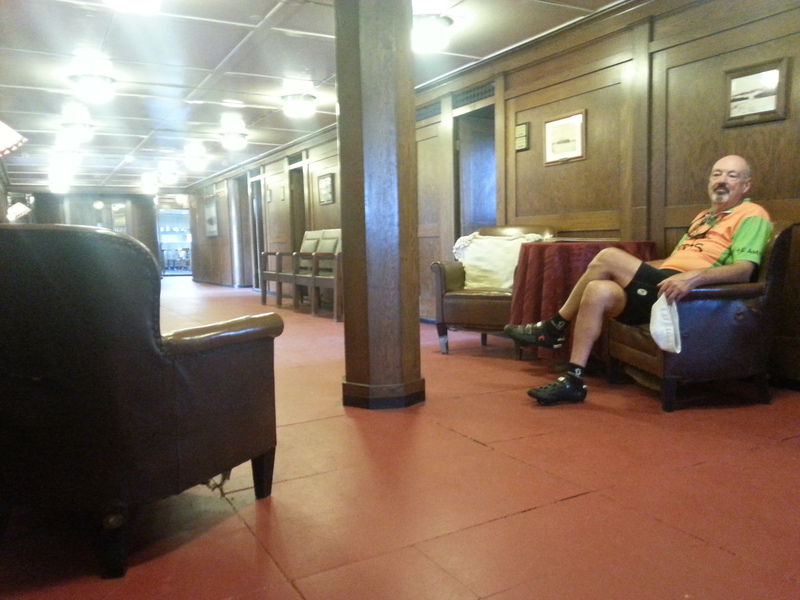 Its enormous hold still has several rail cars in place, crowded with exhibits and memorabilia of the ship’s glory days. Lake Michigan was crowded with such working ships in the 1900s. In autumn, theboathotel (shipotel?) is converted into a haunted Halloween attraction. We elected to drive to Pentwater, MI to cut the 125 mile distance from Grand Rapids to a more manageable number for cycling . On a perfect day, we wandered around NW Michigan, and tallied 65 miles before rolling into Manistee. Our first glimpse of the ship was pretty impressive. As our hostess gave us a quick tour and showed us to our staterooms, it was quickly apparent that this was in no way to be an evening of luxury. Our tiny ‘stateroom’. Some of the rooms featured Pullman beds. When was the last time YOU slept in a bunk bed? One with an 80 year-old mattress? No worries. We unloaded our gear into our tiny rooms and set off to explore. We had full access to the entire ship – so we rang the bell and turned the ship’s wheel in the pilothouse, imagined cooking for a hungry crew in the tiny kitchen, and peered into many dark, grimy crevasses both above and below deck. 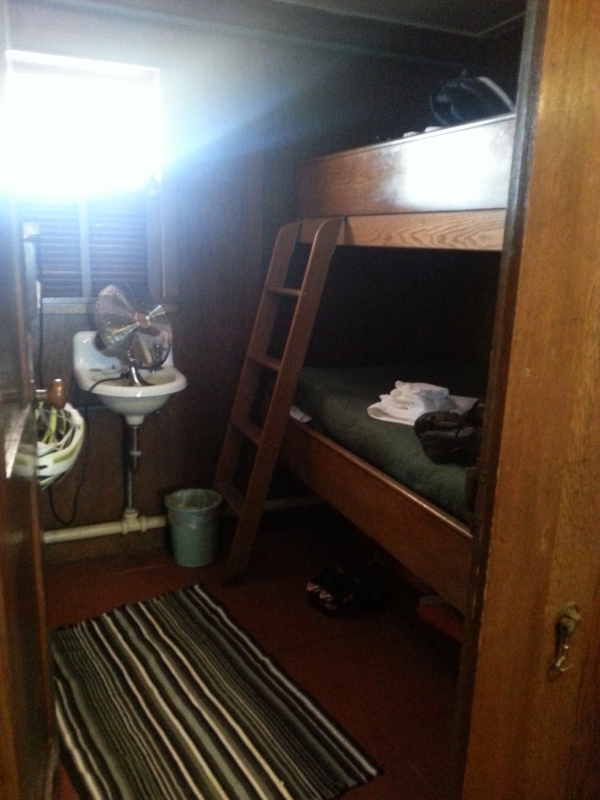 The below-the-waterline crews’ quarters have not been restored in any way, and offer a sobering idea of what the life of a Great Lakes sailor must have been like. Not a glamorous life by any stretch of the imagination. 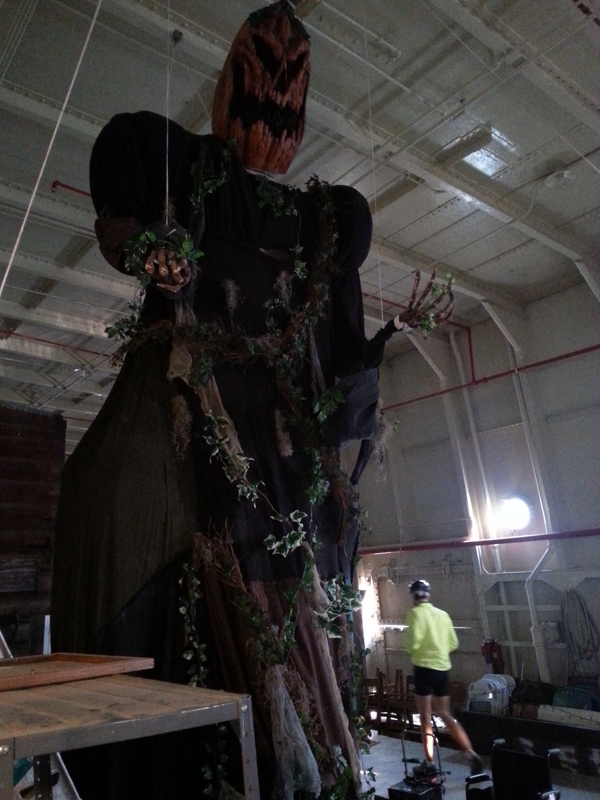 Lisa and I discovered some of the Halloween props while Matt and John poked around in the boiler room. More than once, we mused about what fun a Boy Scout troop would have aboard the ship. We showered up in the nearby marina and headed via bicycle into Manistee to check out dining spots. After a day of riding, we were famished, and were lucky to find the Bluefish Grill for a superb dinner. We tucked into pork tenderloin, filet, and perch like we hadn’t eaten for days. By the time we got back to the ship, we were all tired enough that the spartan accommodations and slightly musty atmosphere didn’t hinder a decent night’s sleep. Our $40 room ($25 for the first person/$15 for the second) came complete with continental breakfast. We enjoyed fruit, muffins, juice, and coffee then wandered around the ship again to make sure we hadn’t missed anything. Before hitting the road, we cycled back into town for massive quantities of real coffee at our favorite coffee shop. John’s plan for the return ride to Pentwater was to detour thru a wind turbine farm. We wanted to see how close we could actually get to one of the giant turbines. A few turns down little-used roads, and a hairy quarter-mile down a gravel two-track on our skinny-tired bikes, and we were directly beneath one! We laid on our backs and listened. The sound is of the blades shredding the air – they do not pass silently thru. It’s a tearing sound. Mesmerizing. We spent quite a lot of time beneath the turbine – each of us fascinated by the sound and by the speed and shape of the blades and they sweep thru the air. Sounds corny, but it’s amazing. Pedalpedalpedal into the wind, and we were finally back in Pentwater. Although we rode 20 fewer miles than the previous day, it was a hard ride. Headwinds are NOT a cyclist’s friend. The big kite shop in town lightened John’s wallet a bit as he decided that we needed a big kite in the Fireball to enhance our camping experiences. Then off to the Brown Bear Tavern for a burger (Michigan’s best – a well-deserved award) before heading back home. A curious, low-budget weekend. Camping, but not quite. Would do it again without hesitation. This entry was posted in attractions, cycling, great outdoors, Michigan, museums, retirement and tagged cycling, food, historic sites, Michigan, retirement, road trip, sightseeing by Judy Crankshaw. Bookmark the permalink. Glad we did it! You guys were great sports, and your blog was rather ‘kind’ regarding the Marina’s bathrooms. It was a fun little adventure, that’s for sure. Too bad you weren’t there – we could have used a REAL Captain! What an interesting overnight…sounds delightful. Last year we drove up in a turbine…closer we got, the bigger it was. So impressive and I loved its tune as well. Wish I was as strong on two wheels as you…we hardly get off the man-made trails. Cool post! We always love to find new quirky places to ride. Wish we had some kids or grandkids to take along (sometimes).